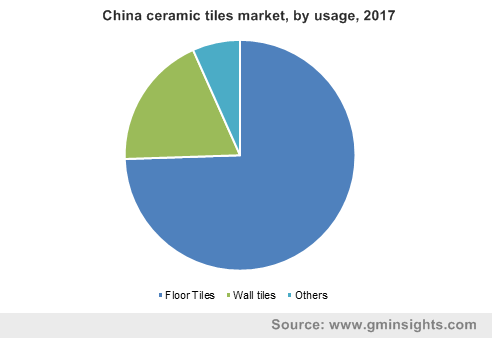 Ceramic Tiles Market size was more than USD 87 billion in 2017 and will witness 9.9% CAGR during the forecast timespan. Rapid growth in building & construction industry in regions, especially Asia Pacific and Latin America shall drive ceramic tiles demand over the forecast timeframe. Government initiatives and investments in infrastructure and demographic features in countries in Asia Pacific are the key factors propelling the product usage in the region. Robust growth in the flooring industry is analyzed to positively influence the product demand over the projected timeframe. The product is extensively used in the flooring industry, particularly due to its strength, durability and value-added aesthetic appearance. It efficiently decreases the cost related with paints & coatings required in walls. In addition, it also offers negligible maintenance cost post installation. Technological advancements in the industry has introduced high quality products along with eye pleasing appearance. Various ceramic tiles manufacturers are now using inkjet printing technology to meet consumer demand for aesthetic tiles. However, prevalence of stringent environmental regulations along with increasing raw material prices may hamper the global ceramic tiles market size by 2025. Moreover, carbon dioxide emission during the product manufacturing is likely to hamper product demand during the forecast timespan. Emission of carbon dioxide from manufacturing industries in regions such has North America and Europe has decreased due to the rising awareness about global warming. The flooring business in North America and Europe shall witness moderate growth rate owing to the strict government regulations and saturation prevailing across the construction industry in past few years. Countries in Asia Pacific are poised to hold a larger chunk of flooring market over the forecast timespan on account improvement in economic conditions, extensive industrial base and availability of resources. These factors, in turn, are anticipated to drive the demand for ceramic tiles during the forecast period. Increasing use of marble, wood, stone and porcelain for flooring in residential structures is likely to pose a threat to product demand in the coming years. The high cost of these floors is presently lowering the substitution threat for the market and shall continue to do so in the coming years. Floor tiles was the largest consumed segment of the overall market in 2017. This segment will be the fastest growing segment from 2018 to 2025. Product properties for flooring end-users such as superior shock & thermal resistance and high durability as compared to hardwood is likely to have a positive impact on the global ceramic tiles market size over the forecast duration. Ease of replacement and installation are some major characteristics of ceramic tiles which makes them ideal for flooring. 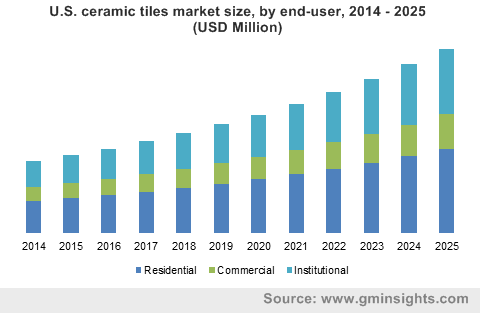 Ceramic tiles market for new construction activities shall witness maximum gains over the forecast timespan. This can be attributed to the rising construction business in Asia Pacific, which has led to an exponential demand for ceramic tiles in case of residential and institutional construction projects. Moreover, growing commercial construction business in parts of Latin America will also positively influence the market size growth in the coming years. Increase in remodeling activities is estimated to boost the product demand in residential segment of the global ceramic tiles market during the forecast period. Consumer specially in European countries are spending massively to increase wall and floor appearance which will be a prime factor fueling product demand for residential segment in the coming years. The commercial end-user segment shall exhibit medium market penetration in the next few years owing to the saturation of the commercial construction industry, especially in regions such as Europe. 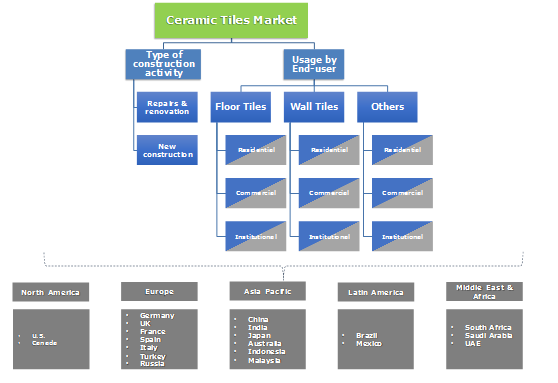 Asia Pacific accounted for the largest share in global ceramic tiles market, both in terms of volume and value. Ceramic tiles manufactured in Asia Pacific (domestic) are supplied through distribution modes such as wholesale and online portals respectively. This is followed in countries such as China and India in the region. Middle East & Africa is likely to be the fastest growing region in global ceramic tiles business. It can be attributed to the rapidly growing construction business in Saudi Arabia, Qatar, Kuwait and UAE. In addition, Egypt is emerging as a centre for foreign direct investments and shall promise a bright future for product demand over the forecast duration. Saudi Arabia, as per World Bank reports has capital projects worth close to USD 1.2 trillion in pre-execution stage, as compared to USD 713 billion in UAE, USD 578 billion in Egypt and USD 215 billion in Kuwait. 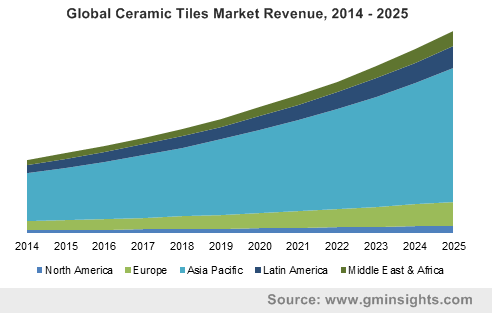 These figures show of an impressive growth for ceramic tiles industry in near future. The ceramic tiles market is highly fragmented with only five to seven major companies holding less than 20% of market share. The prime market share contributors are Mohawk Industries, Ras Al Khaimah Ceramics, Siam Cement Group Kajaria Ceramics and Lamosa Grupo. The industry ecosystem depicts high degree of forward integration of manufacturers. Players such as Mohawk Industries Inc. and Kajaria Ceramics Ltd. have forward integrated their business operations; these companies distribute products across the globe. This substantially help these companies to retain their global presence along with meeting the increasing product demand. Other manufacturers include Florida Tile, Crossville Inc., China Ceramics and Ceramiche Atlas Concorde. Ceramic tiles are highly employed as building materials in construction business. Various types of clays, industrial sands, minerals, and other additives are used in this tile processing. Clays such as bentonite clay, ball clay, and kaolin are manufactured by companies including Old Hickory Clay Company and Ashapura Group. Industrial sands such as silica sand are provided by Bathgate Silica Sand, Badger Mining, etc. Minerals such as feldspar, kaolin and zircon are the most important raw material ingredients. These are supplied by large scale manufacturers such as Esan Eczac?ba?? and Iluka Resources.